Mammalian mitochondrial ribosomes (mitoribosomes) synthesize 13 proteins, essential components of the oxidative phosphorylation system. They are linked to mitochondrial disorders, often involving cardiomyopathy. Mitoribosome biogenesis is assisted by multiple cofactors whose speciﬁc functions remain largely uncharacterized. Here, we examined the role of huma n MTG1, a conserved ribosome assembly guanosine triphosphatase. MTG1-silencing in human cardiomyocytes and developing zebraﬁsh revealed early cardiovascular lesions. A combination of gene-editing and biochemical approaches using HEK293T cells demonstrated that MTG1 binds to the large subunit (mtLSU) 16S ribosomal RNA to facilitate incorporation of late-assembly proteins. 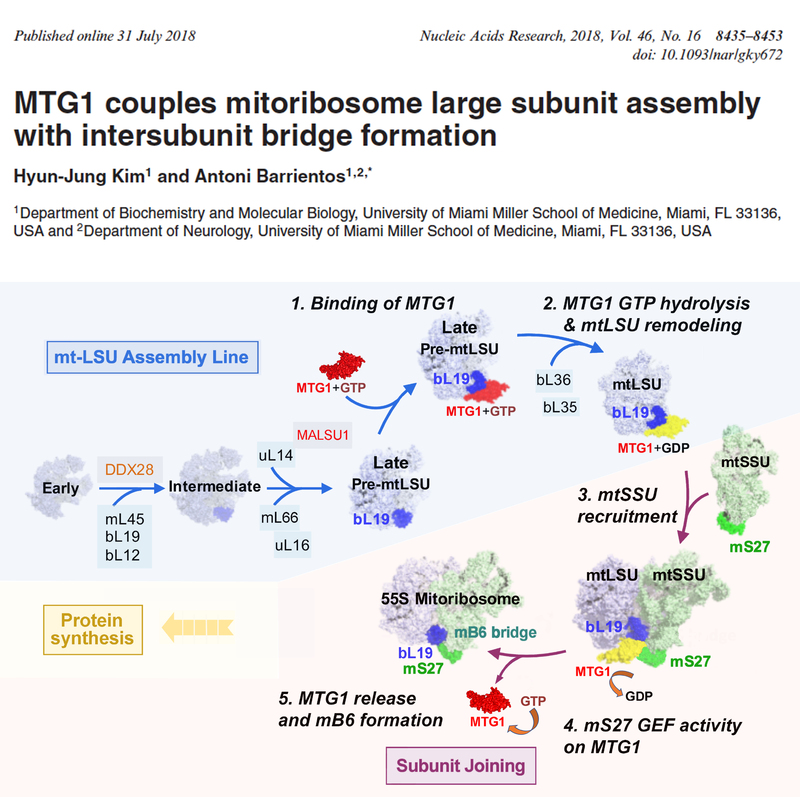 Furthermore, MTG1 interacts with mtLSU uL19 protein and mtSSU mS27, a putative guanosine triphosphate-exchange factor (GEF), to enable MTG1 release and the formation of the mB6 intersubunit bridge. In this way, MTG1 establishes a quality control checkpoint in mitoribosome assembly. 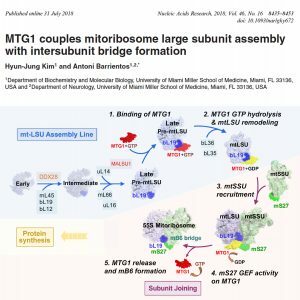 In conclusion, MTG1 controls mitochondrial translation by coupling mtLSU assembly with intersubunit bridge formation using the intrinsic GEF activity acquired by the mtSSU through mS27, a unique occurrence in translational systems.